We have some great news to share regarding one of our clients, Century21.ca: In less than two years since relaunching their website with WhereToLive.com, Century 21’s website has become the #1 real estate brand website in Canada. Only one website is now bigger when measured in monthly visitors: realtor.ca. This is an incredible achievement over a short period of time. Century 21 isn’t currently the largest brand in Canada. But that hasn’t stopped them from having a winning website that provides tangible value to their network of brokers and sales representatives. A winning strategy combined with powerful online marketing tools is driving Century 21 Canada’s online marketing success. Congratulations to Century 21 on reaching the incredible milestone of #1 in Canada in less than 2 years. We look forward to many more years of growth together. You can read more about Century 21 Canada’s website growth on their blog, or follow @Century21Canada on Twitter. This is jusr awesome news and a great article I can send to my clients! Century 21 let’s rock 2010~!~!~!~! Thanks Ed…congratulations to you and your colleagues on the fantastic results you’ve allowed us to achieve! Congratulations to CENTURY 21 Canada, to Where To Live, and to all of the CENTURY 21 franchises and agents to have filled this marvellous website with valuable content! I proudly share this with my clients and let them know that we are not just ahead of the curve, we are drawing the curve that other’s have to follow. If an agent is trying to make an impression in the big www .how does competing with his company help ? The corp site gets the leads and hands them out to the favoured few or sells them back to the agent as a referral . @Jim, thanks for raising those concerns. Every company has their own lead distribution systems. 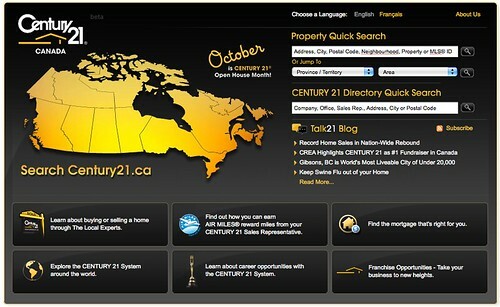 In Century21.ca’s case, they’ve designed their site in a way that leads, in most cases, go directly to agents. For example, if you were a Century 21 agent, you’d have a site at century21.ca/Jim.Straughan which would rebrand the century21.ca site to you when you drove traffic into the site. Each page of the site would show your phone numbers & email, and all of the forms would generate leads to you as well. Regarding long-tail searches, competing for traffic at this level is one of Century21.ca’s competitive advantages. I have noticed recently that searches specific to London Ontario real estate and specifically actual addresses of houses for sale In the London, Komoka, Kilworth area coming up relative to your efforts on behalf of Century 21. Definitely you’re doing good work for search engine optimization for the local London realtors associated with Century 21 here in London. Congratulations on work well done.